Atlanta Braves officials held the groundbreaking ceremony early Tuesday morning at the location where construction will soon begin for the $672 million stadium, which had its name officially revealed in front of a crowd that included Braves officials along with city officials from around the Cobb County area. With Braves Chairman and CEO Terry McGuirk joined alongside by Bill Rogers, CEO and President of SunTrust Bank, the pair took stage on the podium and pulled the curtain off of the sign that officially unveiled the name for the new Braves stadium to be SunTrust Park. 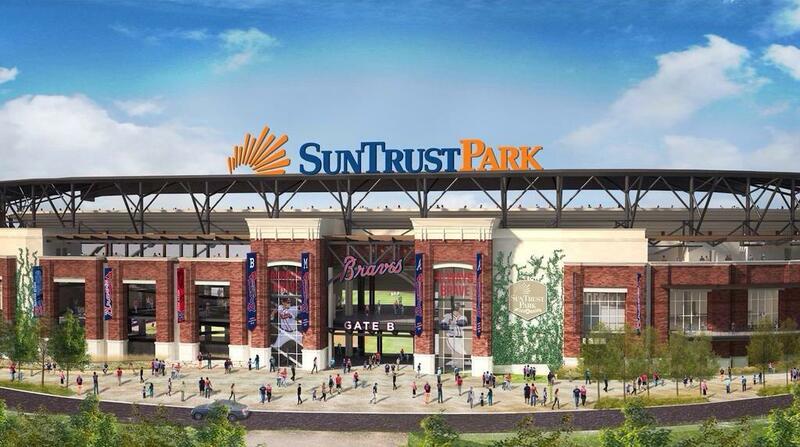 McGuirk announced that both parties agreed to a 25-year partnership, which included the naming rights for the stadium and for SunTrust president Rogers, and that he could not envision his bank affiliating themselves with a classier franchise than the Atlanta Braves. In a side interview, the Braves president spoke in a tad more detail about the plans for the field measurements. “It will be similar to Turner Field, but with some unique elements to it,” said Scheurholz, “It won’t be as symmetrical as Turner Field.” Some features for the park will include an expanded four-level Chop House along with a see-thru right field fence that will accommodate patrons and allow them access to a peculiar view of the action. This will be joined alongside with first-class dining experiences and entertainment surrounding the stadium.